Behind every mask is a real man. Two men joined by blood but separated by murder: Thomas, the rebellious doctor and heir to the vast Wayne empire, and Bruce, his son, whose life is forever altered when he witnesses the brutal death of his parents. The slaying of Thomas and Martha Wayne is the torturous point on which Bruce turns to become the mysterious crusader Batmanthe genesis of a simple mugging gone horribly wrong. The Dark Knight's file on the case has long been closed, the foundations of Bruce Wayne's secret life secure. 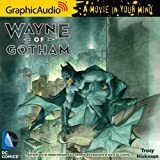 But these foundations are shaken when an unexpected guest invades the grounds of Wayne Manor, raising questions about the event that ended the lives of the mother he loved and the father he worshipped, and sparked his unquenchable drive to protect and avenge. To discover his true family history, Batman must face down old foes, confront his only confidant, invade the evil heart of Arkham Asylum, and shoulder the terrible new burden of a dark legacy.